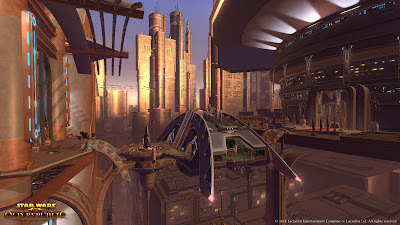 The Old Republic is a Massively Multiplayer Online Roleplaying Game (MMORPG) being developed by BioWare's Austin, TX studio, in conjunction with Electronic Arts and LucasArts. Set to take place approximately 3500 years prior to the events of the movies, TOR picks up the story 300 years after the Knights of the Old Republic games. While it is not a direct continuation of the KotOR games, some of the story does have links to those games.The game is set several years after the Treaty of Coruscant put a halt to all-out warfare between the Republic and the Sith Empire, following the Empire's brutal invasion and the sacking of the Republic capital. Open war is now once again all but inevitable, and it’s into this tense galactic standoff that you thrust upon starting the game. 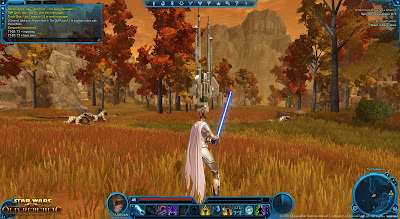 A Star Wars MMO? What else could you want? I’ve never been a really big fan of RPG’s it’s only been recently that I’ve tried Bioware’s Mass Effect and Dragon Age Origins the latter probably being my most enjoyable but didn’t really warm to the whole “manage the inventory, armor, talents and attack plan of your whole group of characters not just yourself” thing, I much prefer to only manage my own character (and sometimes I can’t even do a good job of that) What I did like however was Bioware’s signature “choose your own responses” type of conversation with NPC’s. I found it fun to get all the information I could out of a conversation, or even choose some of the more offensive or inappropriate responses just to see what the npc would say. Once again Ben “Yahtzee” Croshaw was right as I got partway through the game then found I got quite bored with the current and started doing the beginning areas of each race just to see what they were like. In regards to other RPG’s I have recently finished Mafia II but that’s more along the lines of GTA4 and Red Dead Redemption rather then an RPG. I really have not tried any MMO’s for a long time now (one of them being my ill-fated trial of the Korean made Lineage II and that was made even worse by playing on a hacked server) obviously I did hear about Star Wars Galaxies and Lord of the Rings online and they did sound appealing but I didn’t delve into the mix mainly because they need a subscription to be played and I can’t be bothered getting the ‘trials’, though technically I did try WoW as a trial and have liked it ever since. As for Aion and Conan and also Warhammer Online (I believe their making a 40k one also) I didn’t even bother either because I heard a lot about people trying it then just stopping and letting it gather dust or because of the overwhelming factor is that I already had WoW and I liked it and wanted to play more of it instead of some other attempt at a good MMO, which seems to be quite a large problem that a lot of WoW players experience. This is the problem of the WoW “drug” which comes into effect with WoW players want a newer better MMO to replace WoW but after finding one and playing it for a while they end up crawling back because it just isn’t WoW, all the while Blizzard (and Activision) laugh maniacally as they steamroll any competition largely due to this recurring theme amongst WoW players, and thankfully it hasn’t happened to me yet and I very much hope it doesn’t because I am looking forward to the Old Republic quite a bit. And one thing I am interested in is having those “selective question/answer conversations” that I mentioned earlier that Bioware do so well in a Star Wars environment, it’s one thing to learn a whole backstory while you are playing the game, it’s even better when you already have an idea of whats going on before you even start playing the game. I’m going to try and read as much of the backstory that I can and I’m even thinking of watching the first three Star Wars films (i.e. the newest ones) in order to be fully knowledgeable yo. Also it appears we’re going to have our own personal starships which would be a great new aspect to my MMO playing especially since WoW did not have any player housing (for somewhat obvious reasons) Having an area to just relax, view your stats and talk to anyone you have with you at the time (much the same as dragon age) would be great. A big thing about WoW is the personal mounts i.e. horses, rams, gryphons, wyverns etc it seems there isn’t much in the way of personal mounts at the moment, but when I think about it it seems reasonable that a lot of the transport is planet based rather then race or class based cause it would be kinda weird having differrent animals on planets they shouldnt be. Another thing I found quite interesting was the addition of "crew skills" which basially allows the NPCdimplomacy or treasure hunting missions by themselves all while you aren't there which is quite an interesting feature. Well thats all I should go on about for now, as you can probably guess I'm quite excited about this game as are alot of people. I don't really want to get into the whole "is this a wow killer or clone" argument as I just think this will be a geat game and am looking forward to playing it. Once it comes out I may do an update on my thoughts and observations but untill, then, pateince and anticipation! I will leave you now one of the coolest trailers for a game I have seen so far. May I present... Han Marston!